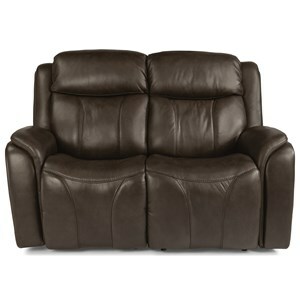 Update the look of your home without overpowering the current style with this comfortable and stylish power recliner. Pillow arms and a high-density seat cushion offer an abundance of comfort for you to look forward to sinking into every night. 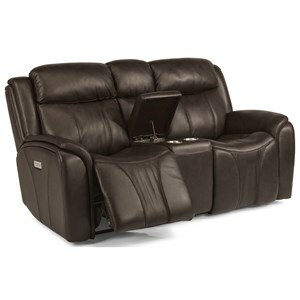 The independent power reclining, headrest, and lumbar make it easier than every for you to find the most comfortable position possible for you to relax in, while the home button on the control panel makes it simple and convenient to return the recliner to its original position. The USB port included with the power button control ensures you never have to worry about your phones or tablets being out of battery or out of reach. This recliner requires 9" of wall clearance. The Latitudes - Paisley Contemporary Power Recliner with Power Headrest and Lumbar by Flexsteel at Home Collections Furniture in the Denver, Aurora, Parker, Highlands Ranch, Castle Rock, CO area. Product availability may vary. Contact us for the most current availability on this product. 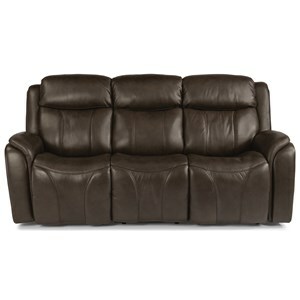 Bring updated style, comfort, and functionality to your living room with this power reclining collection. Independently adjustable reclining as well as the power headrest and lumbar mechanisms give you the ability to find the perfect position for you to relax in. Each item in this collection features comfortably plush pillow arms along with high-density seat cushions to ensure that you'll be able to easily sink into your favorite seat after a long day at work. Every piece also features a USB port next to the reclining controls, ensuring you'll be able to easily be able to keep your devices charged and near you. The Latitudes - Paisley collection is a great option if you are looking for Contemporary furniture in the Denver, Aurora, Parker, Highlands Ranch, Castle Rock, CO area. Browse other items in the Latitudes - Paisley collection from Home Collections Furniture in the Denver, Aurora, Parker, Highlands Ranch, Castle Rock, CO area.